Apocalyptic themes might have been common for a while in Hollywood movies, but they are also returning to the literary mainstream. The Road by Cormac McCarthy, set in a bleak dystopian landscape, and itself adapted for the big screen, is arguably the best known example. Margaret Atwood, Jim Crace and Will Self have all recently engaged with contemporary worries of nuclear Armageddon or the consequences of climate change, just as writers like John Christopher and John Wyndham examined similar fears in the Cold War of the 1950s. In American Karen Thompson Walker’s much-publicized debut, Mother Earth finds a brand new way of taking revenge on a negligent humanity. What would happen, the novel postulates, if our planet started to turn more slowly on its axis, if days and nights began to lengthen, if time itself began to change? The answer, it quickly becomes apparent, is catastrophe. The Age of Miracles is more interested in the effects of ‘The Slowing’ on the lives of the characters, than in getting bogged down in its causes. No scientist in the book understands why the phenomenon is occurring, but mankind’s despoliation of the world is thought to be contributory. As the days wax longer and hotter, and the equally lengthy nights turn colder, birds mysteriously sicken and fall from the sky. The grass browns over. Whales and dolphins, confused by the oceans’ new rhythms, beach themselves and die. Crops begin to fail. To maintain some sort of order, governments the world over agree to keep to the old 24-hour clock, so for many people work and schooling are conducted in darkness. There’s a run on blackout blinds to help them sleep when it’s light and bright outside. Food must be grown under lamps, but fuel becomes scarce. Worse lies in wait. Hardly cheerful stuff, yet the novel’s tone is not without hope. This is down to the indomitable spirit of its narrator, a young woman named Julia who revisits her childhood self in the year The Slowing began. Eleven-year-old Julia is the lonely only child of a placid obstetrician and an excitable drama teacher in small-town California. Even before The Slowing her life is a mass of ordinary upsets. Her parents’ marriage teeters along a tightrope. At school she’s a misfit, side-lined by more popular girls. Her secret crush, skateboarder Seth, is for a long time too wrapped up in a tragedy of his own to notice her. The author juxtaposes very effectively the huge slow devastation of life on Earth and these often heart-breaking small nuances of human relationships. Maybe this balance could only have been achieved through the eyes of a child, for children live so much in the present. It’s the age of early puberty, a period of great change, which gives the novel its title. Presumably the author knows more than do I, a non-scientist, about the likely results of the earth’s deceleration. I imagined gravity would be lighter, but in the novel it becomes stronger, causing a sickness dubbed ‘the syndrome’. I couldn’t guess either that the planet’s magnetic field would eventually falter, allowing more of the sun’s radiation to infiltrate the atmosphere. At least as interesting is the characters’ reaction to the disaster. Although there’s initial panic and hoarding of supplies, many families continue their ordinary routines. By this account people won’t get nastier or nicer when the world is coming to an end; they’ll act their usual selves, but more stressed. A big division yawns, however, between the vast majority who carry on as usual under ‘clock time’ and the free-thinkers and religious cultists who break with their old lives, move to communes and try to adapt to ‘real time’. Cue many aphorisms about concepts of time and its centrality to our existence. If this novel were more directly about climate change or nuclear disaster, both of which are reasonable to fear in our future, I would have found it unbearable to read. The slowing of the earth’s revolutions, however, seems a relatively unlikely thing to happen and this allowed me to consider its valuable messages in more comfort, which was clever. 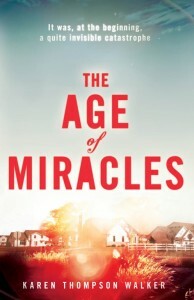 Ambitious, suspenseful, inspiring and well written, The Age of Miracles should have wide popular appeal. I think it lives up to the hype.